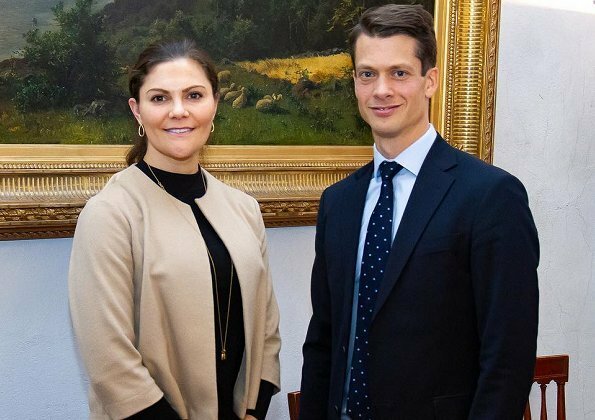 On February 12, 2019, Crown Princess Victoria received Peter Wiwen-Nilsson at Stockholm Royal Palace. 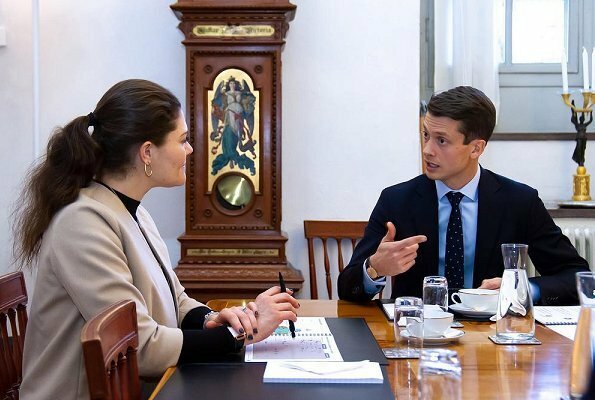 Peter Wiwen-Nilsson is the CEO of Race For The Baltic Foundation. Race For The Baltic Foundation is a non profit organization which aims to accelerate action to clean up the Baltic Sea. Peter Wiwen-Nilsson comes from the private sector where he has broad experience with several CEO and management positions. Most recently he has worked as a Fund Manager and CEO at Brunswick Real Estate. Previous roles include deputy CEO at Elite Hotels of Sweden, CEO at ORTIC. Victoria looks lovely today, like the coat what ever one can see of it. A modest outfit for the low key event - well matched. But I don’t understand the point of a coat indoors. Especially as she was not on trip away, coming from a walk about outside, in that case it would have made a little more sense (although, even in that case, I would argue she should have taken the coat off once inside - and this by the way is an observation that applies to many other royal ladies, they all have ladies in waiting or assistants who accompany them on such visit who could carry the coat for them, like they do with the flowers etc). Can you imagine how it would look like if the gentleman was also wearing his coat at the meeting?!!!! Awkward! I don't believe it's a coat, rather a jacket. The man is having a jacket too😉. I like her ponytail, she looks younger here than in the bun. Ça ne semble pas être un manteau,même pas une veste ,il n’y a pas de de boutons ! Horrible style - this jacket makes her look bulky, hair just pulled back into ponytail. Always dignified and pretty dressed. I wish I was royal. Many women are dignified and well dressed around the world not being royals and I am pretty sure you can be too if you are not already.